Jason Hawes has done it again. According to his official website he is an author, ghost hunter and plumber. What a guy. If you are one of the few people in the world that does not know who Jason Hawes is I will be happy to explain. Jason Hawes is the founder of TAPS or The Atlantic Paranormal Society. He and co-founder Grant Wilson put together a team of researchers to basically work for us. Their goal is to help with all things paranormal. We thank them all for their dedication and hard work. 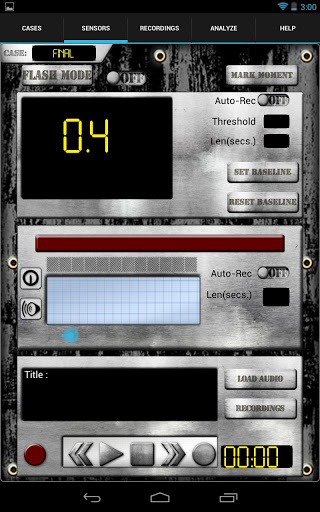 Why a new app for Ghost Hunting? According to Jason Hawes it is the expense for equipment. Now with this new app we can all afford to ghost hunt. Thanks Jason! TAPS promises to bring professionalism, personality, and confidentiality to each case we investigate. We understand that it is tough to call someone like us, and we respect your right to privacy. We bring recording devices to your home to capture evidence of paranormal activity, but they are only used with the homeowner’s permission. We will not share or publish any of the media or any details of the case outside of the close-knit TAPS group. More sensitive cases will be dealt with by the founders and be held under the most strict confidence. We are not amateurs. We have had extensive experience. Part of what we have learned is the psychology of making someone feel comfortable during these times of fear and uncertainty. We will bring a level headed and comfortable atmosphere into your home, in essence, taking care of the most important thing, your discomfort. We will then help you to understand some of the nature of the problem supplying you with the information to understand why this is happening and how little danger is actually involved. We will listen to your experiences and concerns. Then we will set up equipment and begin trying to recreate and debunk personal experiences in an attempt to find good evidence either for or against paranormal activity. We will then share our findings with you and come to a conclusion. You are welcome to copies of any of the recorded media and our phones are open to you should you continue to need comfort or help. We do this free of charge. We will not accept any money for this service whatsoever. Any expenses which may arise are covered by the team. Remember, though we like to have fun, we understand the fear and the seriousness of your situation. We are after all, normal people. Heck, I don’t think we even watch Star Trek. ha ha ha. So, if you are having trouble dealing with paranormal influences in your life, contact TAPS, and we will commit to do our very best to help you. If you have read this blog long, you will know that I personally love TAPS and what they do. For many years now my family and I have watched Ghost Hunters every Wednesday night. What started out as entertainment has now become a tool for me. They have helped me to understand the paranormal more and I have learned the importance of the equipment and debunking. I work at the Sweetwater County Library in Green River, Wyoming. Since the day it was built there have been reports of paranormal activity. The library was built on the grounds of what was the old city cemetery. For twenty years now I have maintained the official Ghost Log. We now do Ghost Walks and special events related the reports and activity. For more information please give us a call at 307-875-3615. It’s official. The Ghost Walk Schedule is done. Thank you to all of you that have been asking for the updates. We have a surprise for you this year. If you will note, on September 7th, PI Team of Utah will be our guest speakers for an afternoon event. PI Team of Utah comes to us from the Ogden, Utah area. They will explain how ghost hunting works and how they do it. 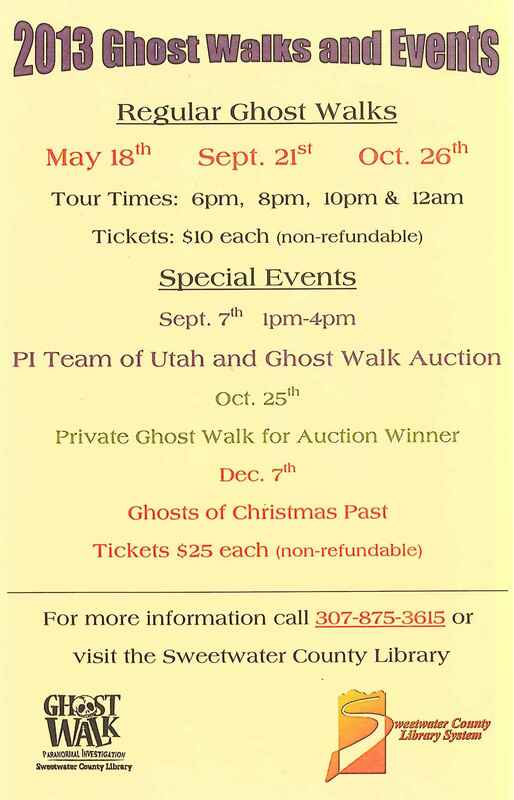 At the end of the program I will do a short presentation on the Sweetwater County Library and then there will be an auction. For what you may ask. A private Ghost Walk. The lucky winner will win four tickets for their own private Ghost Walk which will take place on October 25th. For all of you that have been requesting a chance for a private Ghost Walk, here is your big chance. The money raised will be donated to the Sweetwater County Library System Foundation. We are so pleased and excited to bring this new event to the patrons. The P.I. Team of Utah has been conducting paranormal investigations throughout the West since 2003. As one of the most recognized and well respected groups in the field, the P.I. Team has conducted countless investigations from local residences to large scale haunted locations in the region. P.I. Team members network extensively in the paranormal field and are continually researching to confirm the methodology and technology used within P.I. Team investigations is top notch. With this the team is able ensure the best possible service to our clients and provide reliable information to the public. As a proud TAPS family member all P.I. Team members complete extensive training, evaluations, and background checks prior to receiving the title of investigator. The team takes great pride in conducting professional and through investigations for our clients as well as comprehensive engagements within the community. The P.I. Team of Utah is a 501(c)3 non-profit organization (educational) and never charges fees of any kind for their investigations. Also on the schedule is the 2nd Annual Ghosts of Christmas Past. Once again we will happy to provide the participants with decadent desserts, entertainment and of course a Ghost Walk. It should be a grand event. Please note: The price of ticket sales has changed. Regular Ghost Walk tickets will now be $10 each and Ghosts of Christmas Past $25 each. All sales are final and non-refundable. We hope you will join us for one or all of the events this year.